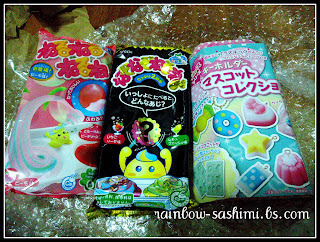 ♥Sweet Treats♥: Where to buy Popin' Cookin? Here's a quick post to where to get Popin' Cookin. People have mixed reactions. I enjoy looking at the videos and would love to taste such food, just to see what powder and water can become. It's really amazing. So where do you get them? These are novelty candy selling for 200-400 yen in Japan. However, due to freight charges, it becomes rather expensive to get them. In Singapore, you can get them from these 2 shops. I adore her! Extremely friendly and nice as long as you don't spam them or anything. They sell each Popin Cookin kit for SGD 9. They also sell Happy Kitchen, Neru Neru Ne, and more. I often buy from them. They also sell most of the Kutsuwa DIY eraser or clay kits, also at affordable prices! They have RETAIL SHOPS and sell ONLINE too. But they DO NOT ship overseas. But I don't really like them. But what gets me isn't the price! Which is defintely more expensive. It's the service! It's not friendly and doesn't feel sincere! Especially when you are using social media, all the more you should be more friendly. Right? Once, I joined this competition and I mailed them in regards to this rule flouter that was genuinely making people mad. No replies. They are pretty ok, not that bad, it's my personal preference. Recently I won their Trivia Question giveaway, because I'm such a Geek in this. I mailed them my address, and they didn't reply. Even when they did, after I mailed them to ask if they receive the message, they simply replied with a single word: "noted". You may think I'm being silly, but I really believe that they could be friendlier. "noted", without caps even, just sounded to distant and unfriendly. I rather a formal sounding reply, like what they use in the public posts. Or maybe it's just me. LoveMelancholy mails out packages, at least for mine, in a nice, securely taped, brown paper envelop, and bubble wrapped the goods nicely, as seen in my haul post. Candyplay, on the other hand, mailed out my 3 packages of candy, with this white paper, wrapped around and taped to secure the ends. By the time I got the package, the white paper was already crumpled badly. There wasn't bubble wraps, and my candies got abit.. crushed. As you can tell, I'm rather biased here. But I do believe there are pros and cons. Candyplay have many retail shops. For those who prefer to see the goods, and get it right away, Candyplay is for you. They sell online too, BUT...! Love Melancholy is cheaper and based online. If you don't mind waiting, or enjoy the excitement of having packages in your mail, LoveMelancholy is for you. Ok, if you live in MALAYSIA, Candy Play has an outlet in Malaysia, you can check out their page. Malaysia is still near enough, so shipping charges shouldn't be that expensive. JBox, who sells tonnes of other goods from Japan. Can get pricey, especially with many other Japanese goods in the site. Self control should be exercised if you want to keep your paycheck. Mode4U, sells Kutsuwa, as well as Popin' Cookin and many more stationery items. Based in Hong Kong, priced in EUR.